A story of what it takes to put on an annual festival. 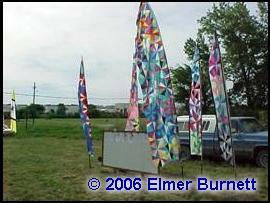 The Topeka Kite Fliers hosted their festival on June 2, 3 and 4, 2006. We had many up and downs in its planning,. As all festival organizers know first and foremost, location, location, location. Twisted Lines have been held for the last 14 years at the same place. This year the city parks and rec. department decided to limit the amount of area to be mowed. For some reason the city decided this should be a native prairie park. This caused some heart burn amongst our members. 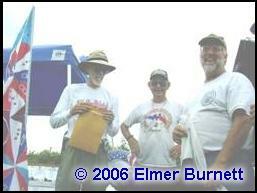 John Marr, TKF president, Elmer Burnett, financial advisor, Bob Crumpler Kiter at large. With only a few months before the festival we were starting from scratch, at least that is what we all thought. At this point we had to revaluate what our kite festival requires. How many acres needed? Convenient for all, plenty parking close to hotels, close to our indoor fly, and any height restrictions. This does narrow it down quite abit. 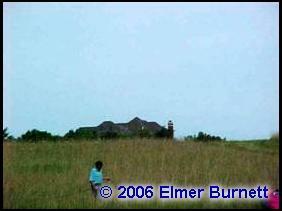 Elmer Burnett suggested Heartland Park, (this is where the NHRA drag racing is held twice a year.) I gave the general manager a call and he was very positive and said we can make this work. But he said he would ask something in return. Well of course I thought he was going to say he’ll need some cash for use of the space but he said they had an “Armed Forces Day” and would like for us to set up our banners and kites to make the area festive for all the soldiers and veterans. Well of course we said it would be tight but we could probably work this into our very busy schedule. With this location confirm by the general manager we just had to get the ok from Forbes Field. I gave the president of the Airport Authority a call and presented our dilemma. We arranged a sit down meeting to discuss our needs. John Marr, my wife, Janet and I met with Mr. Stremming and came out with very positive feed back from him. Of course he had to go over everything with the FAA to get final approval. Well at this point we started to make our fliers and send out the e-mail fliers. We were all pretty excited to have an area larger than we ever had before. A marquee to announce our festival weeks before, and not have to mow was just great. 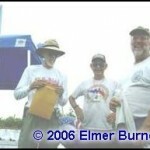 At this point, Bob Crumpler, our kiter at large, or as many know him, the “Tail Man”, became ill due to his diabetes. He was rushed to the hospital by his good friend Pat and has been there for over six weeks, right through the festival. Things were just not going right; he developed pneumonia, which was complicated by diabetes. 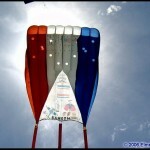 But to jump ahead, Bob is doing much better and I’m looking forward to flying “tails” with him. We should have known this was a sign. The next day I received a call from Mr. Stremming and the FAA has turned down our request to utilize the park due to the proximity to the airport. Back to square one. 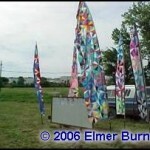 There was another area prime for a festival, but the realtor was quick to put out any idea of flying kites there. So back to the city parks department to see what they could do for us. Grant-Bradbury Park is an open, no barb wire, gentle hill, 80 acres, just ¼ mile off a major hiway, power accessible and just plan perfect for the festival. OK here is the snafu. Here in Kansas we have the Flint Hills, many thousands of acres of native grass lands, just a few miles away. Our City Parks Dept. (CPD)decided to make Grant-Bradbury a native grass preserve. All 80 acres. Now a little history, Twisted Lines Kite Festival has been around for 14 years at the same park. We started out mowing 10 acres and in the last 3 years have been dwindled down to maybe 3 acres. Now everyone reading this knows, how can you put on a festival with 3 acres mowed? (To be sure we did not cut more than 3 acres, CPD said they would cut the grass). And to add insult to injury, they did cut the grass, but two weeks before festival, and grass was about a foot tall the day of festival. CPD was to busy to come out to cut down to a manageable height. So out comes my Craftsman tractor mower, we started cutting as soon as the grass was dry enough. We mowed right up to the last minute. 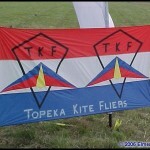 I really think Topeka Kite Fliers should win some sort of an award here. The category would be “The field that challenges you”. Dead grass ankle deep, an area mowed just large enough for a competition field and the rest waist high “native grass”. We forged ahead. Friday night we had a barbecue and night fly. Attended very well but Mother Nature thought we should just visit that evening for there was no wind. Saturday, light winds, but was a beautiful day. We held “Fun Flies” throughout the day and sneaked in competition. Competition: We started out with Novice Precision. 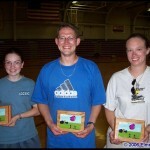 Chris Clark and Lizzie Gilson from Kansas City Kite Club went head to head. Chris came out on top with a 54.03 and Lizzie at 51.77. 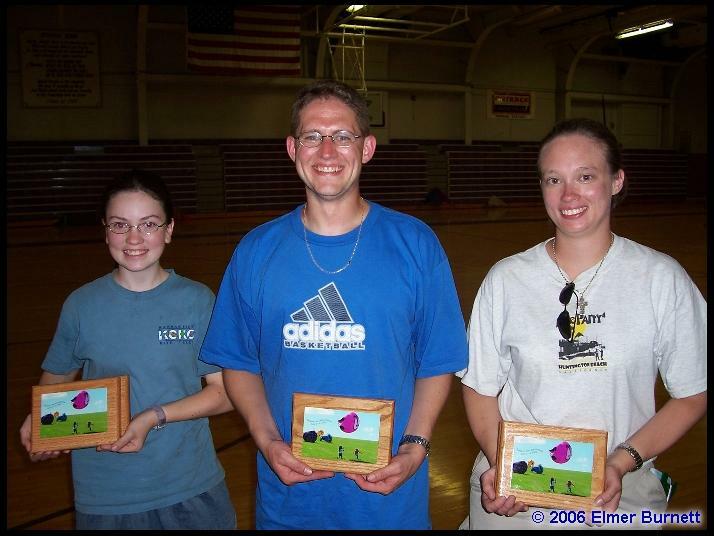 Lizzie took first place in Ballet. Donna Houchins from Washington, Missouri took first place in Experience Precision with a 79.07 and Ballet 54.93. 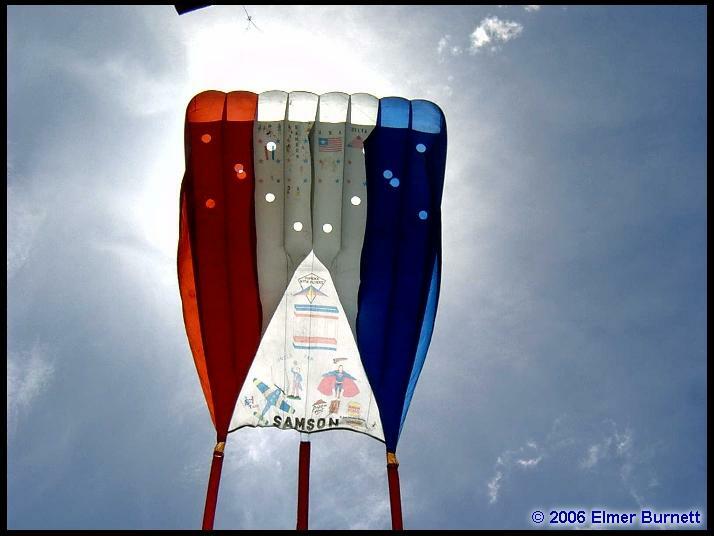 Coolest Banner award goes to Laurie Gilson with “Kite-Dad”. Banners, yes we had banners, the many dozens from Linda Larkey from KC. 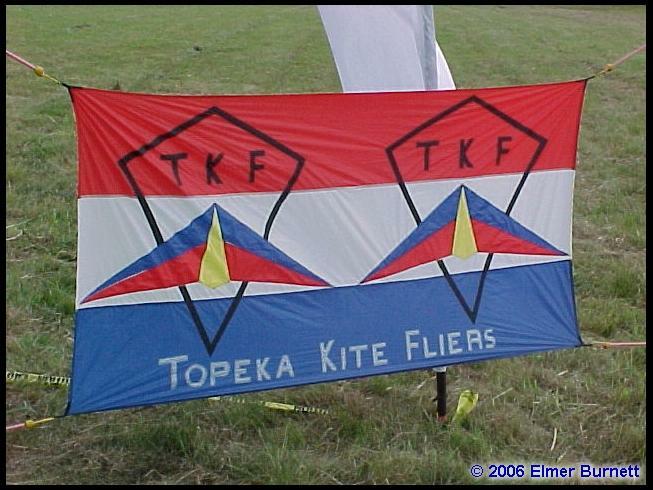 Paul Homan’s, Topeka Kite Fliers and Larry Stiles and Catherine Gabrel from Tulsa. The field was surrounded with custom made banners that can only make you smile. Carveth Kramer (a TKF who happens to live in Taos, NM) would have been impressed. Missed you Carveth. Even Bob Crumpler’s banners where on site which added to our painted scenery. Saturday evening we gathered at a local sports bar for a sit down dinner. All went well except David Ellis decided his car needed overhauling and my wife decided to challenge Larry Stiles to a beer chugging contest. In both cases no one was injured or embarrassed. Following dinner we had an indoor fly and live auction. We (TKF) never know how the auction will go. This year, even though we didn’t break any records it was very successful due to all who donated. We were able to donate a sizeable dollar to American Diabetes Association. Sunday started out with a storm that watered down our field so the dead grass wouldn’t blow away and then turned into a beautiful Kansas day. Larry and Cat surprised Bob Crumpler at the hospital for a short visit and some nice gifts. And rest of day was filled with kites painting the sky. All in all the festival was successful. This was our 14th year at this field, hoping there will be a 15th at the same place. Needless to say there will be a 15th Annual Twisted Lines Kite Festival, location to be announced. This entry was posted in 2006, Events / Festivals, Issue 49 (Jul/Aug), KL Archive and tagged festival, kansas, twisted lines.